The past week has been a bit of a crazy whirlwind, with interviews left and right, as will be the next weekend. Last night I finally gave in and made a dish, even though I was short on time (hey, you gotta eat when you gotta eat, and I was sick of nibbling on leftover Halloween candy already haha). Shanghai bok choy is a very distinctive vegetable that also happens to be pretty popular in all types of Chinese cuisine. I have never seen it used in Western cooking, nor is it sold in American supermarkets, so I assume that it is not grown in the US much. It is very different from other types of "bok choy", including regular and baby bok choy, which have white stalks and dark green leaves. Shanghai bok choy is small (about the size of my hand in height), has a light green stalk and a medium green leaf, and when a stalk is peeled away from the vegetable it looks like a spoon (my friend likes to call it a "spoon vegetable" lol). It is a very tender vegetable, and simply beautiful when sauteed, as the green color brightens just like broccoli. The flavor is mild, and you can control the crispiness with the amount of time that you cook it, making it a great vegetable ingredient for any dish. You will often also find it as a vegetable garnish that encircles plates of meat entrees. Anyway, I like to sautee it by itself as a healthy vegetable dish, but sometimes I add some protein if there are no other dishes being made. The recipe is very simple. You first have to wash your shanghai bok choy very well, because dirt gets trapped between the stalks as the vegetable grows up. So you peel off each stalk and wash it individually. The "heart" of the bok choy can also be eaten, provided you cut off the tough stem at the very bottom. Depending on the size of the bok choy you bought, you can either cut them in half to separate them into the leaf portion and the stalk portion, or you can cook them as is if they are not too big. (You'll want bite-size pieces that are about 1×2" in size if it is stalk, and whatever size you like if it is leaf, as the leaf will wilt). Next, you heat up a skillet with a bit of oil, and when the pan is hot, drop in the bok choy all at once. There will be water on the leaves so you'll get a pretty loud pop as the vegetables start to sautee. Stir them around until you start to see the green color brighten (just a minute or two). Add a few tablespoons of water to the pan and then close the lid to let the vegetable steam a little bit. You can cook them to whatever tenderness you prefer, though I like them to be more on the soft side. Add just a little bit of salt to flavor the dish, which will also draw out more water from the bok choy stems. Then they're done! 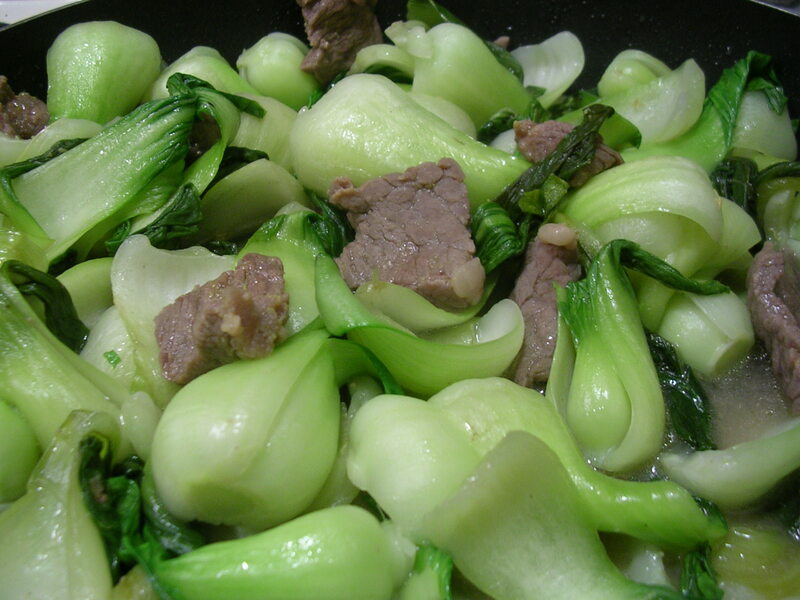 When I made mine, I marinated some sliced beef on the side and seared them in a separate pan before adding them to the almost-finished bok choy. (Although my beef was kind of ugly looking since I accidentally left it thawing in water, so the meat lost a lot of blood and juice via osmosis…um moving on…) Still, it was very delicious, and I ate a lot of it with rice as it was the only dish I made. If I think about it, the dish is so healthy! It only needs a tiny bit of salt and oil, and is mostly vegetables. And according to Wikipedia, shanghai bok choy has a whole lot of vitamin C, folic acid, beta carotene, calcium, and fiber. Mmmmm. This entry was posted on Sunday, November 4th, 2007 at 10:52 pm	and posted in Chinese, cooking, Uncategorized. You can follow any responses to this entry through the RSS 2.0 feed.